The Houston Texans are no joke, boasting the league’s #2 defense and #2 rushing attack. They ran for 188 yards last week against the Cincinnati Bengals, who were one of the best in the league at stopping opposing running backs in their own right (at least until their final two games). While the Ravens will have a decided home field advantage – including a raucous M&T Bank Stadium bowl full of ravin’ Raven maniacs as well as game time temperatures in the high 30’s against a warm-weather dome team – they will have to slow down Houston’s impressive running attack in order to advance to championship weekend. It’s a cliche in the NFL – make the other team one-dimensional and you greatly improve your chances of success. It’s a cliche for a reason though: it’s usually true. Unless the opponent boasts one of the league’s great quarterbacks like Tom Brady, Drew Brees, or Aaron Rodgers (at least one of whom the Ravens are very likely to have to deal with at some point should they hope to hoist the Lombardi Trophy), putting the game squarely on the shoulders of the QB is a proven formula for victory. When – as in the case of the Houston Texans – the other team comes in with a starting quarterback who is not only a rookie, but who is making just his seventh career start, and his first on the road in a hostile postseason environment, the tried-and-true “make them one dimensional” formula that defensive coordinators espouse constantly seems an even clearer path to success. That said, there are two ways the Ravens can force the Texans to have to throw the ball. Both are, of course, much easier said than done. The most obvious way to force the Texans to the air is to stop the run, and to set up third-and-long situations. When these two teams met in Week 6, the Ravens did exactly that, and it went a long way towards the ultimate outcome of a 29-14 win. Arian Foster managed just 49 yards on 15 carries (3.3 ypc), while fellow running back Ben Tate fared only slightly better, picking up 41 on 9 (4.6 ypc). Foster, a Ray Rice-esque dual threat, also managed 52 yards on 6 receptions. While “holding” Foster to over 101 yards from scrimmage doesn’t seem all that impressive, consider that he had nearly 200 last week against the Bengals. Foster’s running style is a near-perfect fit for Houston’s zone blocking scheme. Mike Mayock of NFL Network stated during the game Saturday that Foster was the best zone runner he has seen in the league since Denver’s Terrell Davis – very high praise. In Week 6, the Ravens played extremely disciplined run defense, setting the edge strongly and maintaining gap integrity in pursuit, not allowing Foster his signature cutback move. The Bengals did exactly the opposite of that, overpursuing and sloppily trying to fill gaps, and you saw what happened – Foster gashed them over and over. After watching last week’s film, the importance of playing the kind of run stuffing defense they did in Week 6 will be blatantly obvious to Ravens’ defenders. The other way to force the Texans to throw the ball early and often is to put the ball in the end zone a few times early in the game, and build a double-digit lead. Again, much easier said than done against the #2 defense. If B’More can put up a couple quick scores, it will put Houston in the extremely unenviable position of having to ask rookie T.J. Yates to try to bring them back through the air. That should be a recipe for disaster for the Texans, Andre Johnson or no Andre Johnson. I’m not going to lie – Arian Foster scares me. At the same time though, I have confidence that a fully rested Haloti Ngata, Terrence Cody, Cory Redding, Ray Lewis, Jarret Johnson, Terrell Suggs, Bernard Pollard and company can put the clamps on him just as they did earlier this year, and can take advantage of Yates’ inexperience. When the Indianapolis Colts come to town on Sunday, the Ravens have a very good chance to take out a full decade’s worth of frustrations. It has been over 10 full years since Baltimore’s “new” team last beat Baltimore’s “old” team, way back on December 2, 2001. Back in 1998, when the Ravens beat the Colts for the first time, and then-Ravens quarterback Jim Harbaugh ran over and gave the game ball to Johnny Unitas, that was supposed to be the symbolic “moving on” point for Baltimore. Our new team had vanquished our old one, and Johnny U of all people was there to supervise and endorse it. The hatchet had been buried. Unfortunately, the hurt just ran too deep for many Baltimore fans to simply let it go with one regular season victory. Two years later, the Ravens would win their first Super Bowl after only five seasons of existence. The “Indianapolis Colts” had failed to even reach the big game after 17 seasons, wallowing in mediocrity for a great many of those years. That moment was hailed as the next big inflection point in B’More’s relationship with Indy. Only, it seemed that we still weren’t truly over it. After beating the Colts 39-27 later that season, Manning would lead Indy to wins over the Ravens in three of the next four seasons. The Ravens, fresh off a 13-3 campaign, were the #2 seed in the AFC and were set to host the Colts in Baltimore in the Divisional round. THIS. This was to be our last big watershed moment where we would finally exorcise the Irsay demons. 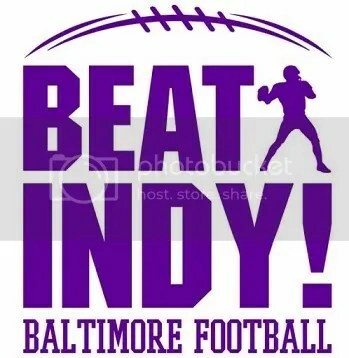 A playoff win over the Colts that would propel the team to their second Super Bowl win would finally crush Indy’s heart enough to appease Baltimore. Of course, that’s not how it happened. Instead, the Colts came in and beat the Ravens 15-6, and a few weeks later it was they, not the Ravens, who were hoisting the Lombardi. Three regular-season beatings later, and this time it was the Ravens traveling to Indy for the 2009 Divisional playoff. Would beating the Irsays, in their house, in the postseason, be enough to help put them in the rearview forever? We wouldn’t find out, as the Colts spanked the Ravens up and down the field for a 20-3 victory. At least they would go on to lose the Super Bowl. The Colts that are coming to town this week, though, are but a shell of their former selves, and all because they’re missing one player – Manning. Sure, they have an 8-game winning streak over the Ravens, but more importantly, they’re on a 13-game losing streak dating back to last season. They look to become only the second 0-16 team in NFL history, and the Ravens can help them get there by taking care of business this Sunday. Now, whether or not it will have any true effect on the psyche of this city isn’t for me to say. The Ravens could start a 10-game winning streak of their own over Indy, and I bet you’ll still see nostalgia pieces dotting the local papers whenever these two teams meet. Some old Colts fans will never truly “get over it,” and that’s alright. For the rest of us, though, we just want to see our purple birds come out on the right side of this match up for the first time in WAY too long. If the Ravens want to get to the Super Bowl this year, they need to keep winning. With the Steelers, Patriots, and Texans all breathing down their necks for those top two spots in the AFC Playoff picture, a slip up against a winless squad at home would be simply unforgivable. Indy will be nowhere near the postseason in 2011, but they could still deal quite a blow to the Ravens’ season. That’s why What’s Important Now is taking the last ten years of frustrations out on the on the field this week. As Goob pointed out, the San Francisco 49ers roll into town this week looking like a mirror image of the Ravens in a lot of ways. 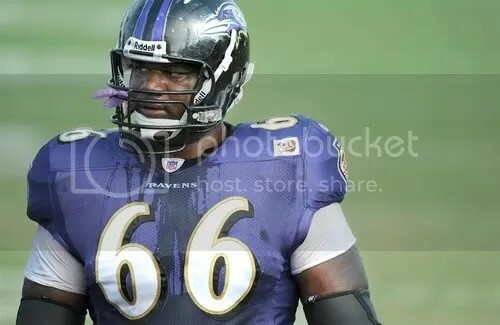 More accurately, though, they look a lot like the Ravens USED to look. The slow, plodding, yet efficient ball-control offense headed up by a game managing quarterback and solidified by one of the game’s best defenses is just the blueprint that the Ravens rode to a Super Bowl victory back in 2000, and is not dissimilar to Joe Flacco’s rookie season of 2008. For the Ravens to emerge victorious from the HarBowl, they have to manage to not get beat at their own game. San Fran comes into B’More at #6 in the NFL in time of possession, holding onto the ball an average of 32:09 per game. The Ravens, on the other hand, are 20th at 29:42, and have won TOP in just one of their last five games after starting the season 4-1 in that important stat. As long as you’re making big, explosive plays that result in, or at least lead to, touchdowns, as the Ravens were able to against Cincinnati, winning TOP isn’t as crucial. However, as we saw last week, losing the battle can still tire out your defense down the stretch and lead to some hairy moments, regardless of how large a lead you are able to build in the early goings. The Ravens had only themselves to blame in the fourth quarter last Sunday, as they were unable to hold onto the ball and put the game away when given the opportunity. From the moment Torrey Smith scored his touchdown and Baltimore staked itself to a 31-14 lead, the Ravens picked up just one first down and were 0/2 on third down tries. Inexcusably, those two third down failures came on 3rd-and-2 and 3rd-and-1. For the day, the Ravens were just 2/6 on 3rd-and-2 or less. That number will have to greatly improve on Thursday in order to keep the ball out of the hands of the 49ers, and keep the defense fresh for the fourth quarter. The 49ers are an NFL-best +17 in the turnover department. Quarterback Alex Smith has thrown just four interceptions to go with his 13 touchdowns, and as a team San Francisco has fumbled just 10 times all season, and they have lost just five of those ten. On the other side, Joe Flacco matches those fumble numbers (10 total, 5 lost) all by himself. Throw in his eight interceptions and the other 10 times that Ravens players have put the ball on the turf, and they’ve given the ball away a total of 18 times – or twice as many times as the 49ers have. On defense, the Ravens got back to their turnover-causing ways against the Bengals, picking off Andy Dalton three times. Even after a 3 INT day though, the Ravens still trail San Francisco in the pick department 15-11. These two teams are 1-2 in recovering opponents’ fumbles as well: the 49ers have recovered an incredible 11 of the 14; the Ravens are no slouches in that department either, scooping 10 of their 15 caused fumbles. Winning the turnover battle will be no easy task against Jim Harbaugh’s stingy, opportunistic bunch. To improve to 8-3 though, the Ravens will have to at least match the Niners in stinginess quotient. Controlling the ball – both by possessing it and by not giving it away – will go a long way to making sure the Ravens don’t get beat at their own game in the HarBowl. While the obvious subject for this week’s installment of “What’s Important Now” with the Pittsburgh Steelers next on the schedule would have been improving the atrocious pass-blocking of the offensive line, with the news today that neither James Harrison (9 sacks in 10 career games against the Ravens) nor LaMarr Woodley (9.5 in 10) that issues becomes just a tad less pressing. Of course, protecting Joe Flacco better will be key to long-term success of this team not only this week but moving forward, but when I went back and re-watched the Ravens-Cardinals game yesterday, another glaring issue jumped out at me: the ridiculous amount of times the purple and black shot themselves in the foot Sunday. 2-3-ARI 3 (12:55) PENALTY on BAL-78-B.McKinnie, False Start, 5 yards, enforced at ARZ 3 – No Play. 2-2-BAL 17 (9:07) 5-J.Flacco sacked at BAL 8 for -9 yards (50-O.Schofield). FUMBLES (50-O.Schofield), RECOVERED by ARZ-90-D.Dockett at BAL 2. 90-D.Dockett to BAL 2 for no gain (84-E.Dickson). Penalty on BAL, Illegal Formation, declined. 3-10-BAL 28 (6:51) (Shotgun) 5-J.Flacco pass short middle to 27-R.Rice to BAL 34 for 6 yards (94-S.Acho). Penalty on BAL-78-B.McKinnie, Illegal Formation, declined. 1-10-ARI 42 (2:00) (Shotgun) PENALTY on BAL-65-A.Gurode, False Start, 5 yards, enforced at ARZ 42 – No Play. 1-10-BAL 47 (3:12) (No Huddle, Shotgun) 5-J.Flacco pass short right to 34-R.Williams to BAL 50 for 3 yards (27-M.Adams). PENALTY on BAL-65-A.Gurode, Illegal Use of Hands, 10 yards, enforced at BAL 47 – No Play. 1-10-BAL 20 (8:48) (Shotgun) 5-J.Flacco pass short middle to 27-R.Rice to BAL 27 for 7 yards (79-D.Carter). PENALTY on BAL-27-R.Rice, Unsportsmanlike Conduct, 14 yards, enforced at BAL 27. 3-7-ARI 40 (3:25) (Shotgun) PENALTY on BAL-77-M.Birk, False Start, 5 yards, enforced at ARZ 40 – No Play. Seven penalties (5 accepted) on the offense, and this on a day where Michael Oher miraculously managed to keep his number out of the official’s mouths. Five of the seven were pre-snap flags (3 false starts, 2 illegal formation), which is completely unacceptable for a HOME GAME! It’s gonna be a heck of a lot louder when you’re on offense in Pittsburgh Sunday night than it was in B’More the other day, fellas. When you’re struggling as an offense, and have shown to be prone to falling into deep and extended lulls of production as the Ravens have this season, the last thing you can tolerate is these kinds of self-inflicted wounds. Yes, the taunting call on Rice was B.S., but that was just one of the seven infractions against the offensive unit Sunday. And then you have Bryant McKinnie, who has been playing in the NFL for 10 years but still can’t figure out how to line up legally? 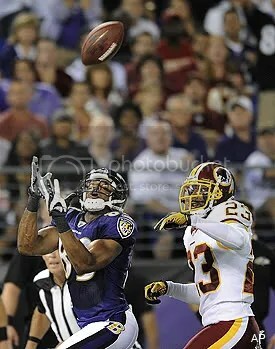 Throw in the four defensive and two special teams penalties Sunday, and the Ravens were flagged a total of 13 times. Eleven of those were accepted for a total of 99 yards. The fact remains that they need to get these things cleaned up, and quickly. Ravens-Steelers games are ALWAYS tightly called, as the referees know the bad blood that exists between these two teams and will attempt to keep things from getting too chippy on the field. Infractions like the two “Taunts” called on Baltimore last week, while seemingly minor and ticky-tack, are just as likely to be flagged up at Heinz Field. We’ve had more than enough games against Pittsburgh through the years decided because of the whims of the guys in stripes. Let’s get these things cleaned up so Sunday night isn’t another in the long line of Ravens-Steelers games that have us hating yellow flags nearly as much as we hate yellow rags. After their 35-7 stomping of Pittsburgh on opening day, the Ravens, for whatever reason – I myself like to blame the Sports Illustrated Cover jinx – suffered a huge letdown in Nashville against the Titans, losing 26-13. While it remains to be seen how legitimate of a team Tennessee really is – they didn’t show many positives in losing 38-7 in Pittsburgh two weeks ago – the way the Ravens got beat on both sides of the ball from the opening whistle qualifies that showing as an unmitigated letdown. Losing to teams with sub-.500 records just isn’t something the Ravens do under John Harbaugh. Since Harbs took the reigns, the Ravens are 19-2 against teams that enter the game with a losing record, and both of those losses were to teams that were 0-1 at the time (Cincinnati last year and Tennessee this year – h/t to WNST’s Luke Jones for the reasearch). The combined record of their next two opponents, the Jacksonville Jaguars and Arizona Cardinals, is a dismal 1-9. With the Pittsburgh Steelers refusing to accept their “old and washed up” status laying down, and the upstart Bengals surprising everyone at 4-2, the Ravens need to continue their recent history of beating the teams they are “supposed” to beat to keep their hold on the AFC North lead before heading into Heinz Field on November 6. Fortunately, both the Jaguars and Cardinals look like they really are just “bad,” as opposed to being decent teams who have caught some bad breaks. Jacksonville’s -60 point differential trails only St. Louis and Kansas City for worst in the NFL, and they’ve managed to score just 72 points in six games (12.0 per game, better than only St. Louis). Facing the Ravens, who are holding teams to just 14.2 points per contest – more than two full points better than the next team – is the definition of a mismatch. As for Arizona, since barely holding on to beat Cam Newton in his first ever NFL start in Week 1, they’ve lost to the likes of the Redskins, Seahawks, Giants, and Vikings, teams with a combined mark of 10-12. Two teams that are quarterbacked by rookie Blaine Gabbert and overhyped trade bait Kevin Kolb should be just what the doctor ordered to get the Ravens to 6-1 before their next key divisional clash with the Steelers. That is, of course, as long as they can avoid another proverbial letdown, not play down to the level of their opponents, and do What’s Important Now – beat a couple of bad football teams. The Ravens made it to their early bye week (week 4 is the earliest a team could possibly have a bye) boasting a very 3-1 record, with all three victories coming in dominating fashion, and two of those over the squads that faced off in last season’s AFC Championship Game. While having a bye week so early can be both a blessing and a curse, it seems to be coming at the right time for the Ravens, who have a number of players suffering from various bumps and bruises who have missed time lately. 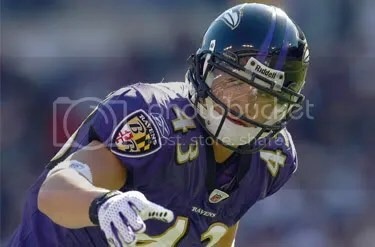 John Harbaugh has given the team an extra few days off on top of what they normally get during byes, perhaps realizing that his veteran-laden club could use the extra rest a bit moreso than the extra reps.
Nakamura is not only a key cog for the team in its nickel and dime packages, but he is also a big special teams contributor. Think back to the fake punt he busted out on the Steelers (can’t remember if it was 09 or 10) that got called back due to penalty. It’s also not ridiculous to think that Joe McKnight’s kickoff return touchdown never happens Sunday night if ‘ruki is on the field. The guy can cover, he can blitz, and he’s a special teams ace. Nakamura is much more important to the team than you’d ever know if you just listened to how many times the announcers call his name. Over the summer, the Ravens knew they could either keep Carr or Josh Wilson around. Wilson signed with the Redskins and Carr stayed in Baltimore with a new deal. At the time, I was OK with it, but it’s looking more and more like the Ravens made the wrong decision, if only because Carr can’t stay on the field. He injured his hamstring in training camp, came back to play against Pittsburgh in Week 1, re-aggravated the injury and missed Week 2, came back against St. Louis, and then the hammy flared up AGAIN in practice last week causing him to miss the Jets game. Carr was a solid cornerback in 2010, and he got better as the season went on. While he doesn’t possess ideal size, he plays good technique and isn’t afraid to come up to make stops in the run game. You could do much worse for your #3 (or #4) corner. Evans was supposed to be the guy that came in and added instant explosiveness to the Ravens’ vertical passing game. We saw shades of what Evans is capable of in preseason games against Kansas City and Washington, but he hasn’t played since Tennessee in Week 2. Even then, he was obviously operating at less than 100%, and he managed just 2 catches for 45 yards after being completely shut out against Pittsburgh. Luckily, rookie Torrey Smith has stepped up and at least given opposing defenses something to think about in Evans’ absence, but if #83 can get back on the field with Smith and Anquan Boldin, the Ravens should truly have a legit Top 10 offense for the first time in recent memory. 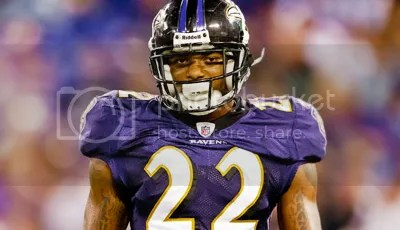 Smith, the Ravens 2011 first round draft pick, is the prototypical cover corner the team has been missing ever since Chris McAlister left. Unfortunately, he was injured covering a kick just a couple minutes into his first NFL game. The high ankle sprain has kept Smith out the last three weeks, as what was initially a position of great depth for the team has become an early season concern (as evidenced by the team signing second-year free agent CB Bryan McCann today). The good news is that Texans’ wide receiver Andre Johnson will likely miss the October 16th match up at M&T Bank Stadium, where Smith’s skills would have been in high demand. High ankle sprains are a frustrating injury for a player, as they tend to just nag and nag, not completely healing or responding greatly to treatments. While Chuck Pagano’s defense has done well to cover for their deficiencies in the secondary with great pressure and creative personnel groupings through four weeks, Smith’s presence will only make what has been a dominating unit that much better. Grubbs is the team’s most complete lineman, but has been sidelined for the last three games with what is basically “turf toe” – a hyperextension of the ligaments in his toe, eerily similar to the injury that hobbled Jonathan Ogden in the waning hours of his Ravens career. The team initially tried to replace him with Mark LeVoir, a failed experiment that lasted only a single game. Andre Gurode has filled in admirably over the last two games, but the team is obviously limited in what they can do running the ball without Grubbs. The former Auburn Tiger can get out in space and lay the wood like nobody else on the team, and the playbook is unquestionably shrunk without Grubbs holding down his left guard spot. I’ve had (have) a hyperextended big toe, and I can tell you that it’s no picnic. I hurt it nearly 10 years ago, and it still flares up to this day. And I obviously don’t put nearly the physical demands on my toe that Grubbs, a 310 lb NFL offensive lineman, does. It’s an injury that severely effected the careers of the great Ogden as well as fellow Hall-of-Famer Deion Sanders. Let’s hope the treatments Grubbs has been getting lead to a full and speedy recovery – even with Ray Rice, Torrey Smith, Boldin, Evans, Ed Dickson and Dennis Pitta, this offense won’t be nearly what it can without consistently winning the battle up front. Grubbs is a Four-Star General in that battle. While it’s a bit discouraging that the Ravens are in such desperate need of a bye week just four weeks into the young season, it’s equally encouraging that they’ve performed so well while missing this many pieces. If they can get these pieces back into the mix and operating at the high level of which they are capable, this will be a very, very good football team for the rest of the regular season and beyond. In last week’s W.I.N. installment, we said that the Ravens would need to improve their passing game moving forward. Well, 389 passing yards and 3 aerial touchdowns later…mission accomplished. For now, anyway. The next step is obviously for the team to continue to improve, and show some consistency from week to week, not take a giant step backwards between weeks 3 and 4 as they did between 1 and 2. The New York Jets secondary doesn’t resemble that of the St. Louis Rams in the least. With players like Darrelle Revis, Antonio Cromartie, Kyle Wilson, and Jim Leonhard, yards through the air will be much more difficult to find for Joe Flacco and company this week. New York is currently 6th in the NFL in passing defense, allowing 188.7 yards per game. For the Ravens to have success against not only the Jets, but many of the remaining teams on their schedule (read: those not in the NFC West), rookie Torrey Smith will have to continue to develop his game. Sunday at the Edward Jones Dome was obviously an INCREDIBLE start for the former Maryland Terrapin, but he has to follow up that performance with more like it. Not to suggest that #82 is to be expected to put up 152 yards and 3 scores every game – don’t be ridiculous. The point is that, now that teams have film on Smith, they have to respect him. 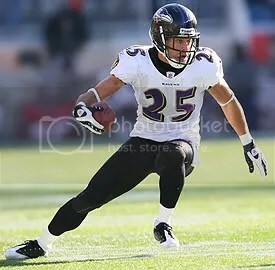 Unlike in years past, when the Ravens had supposed “vertical threats” like Demetrius Williams, Yamon Figurs, or Donte Stallworth – receivers who opposing safeties let run by without so much as a second glance – this year’s team has shown that the guy going long can haul the pigskin in for big plays. Again, for one game only. That’s why I hesitate to label Smith as a “weapon” in the Ravens offense. To be a true weapon, he needs to show up on Sundays consistently. Right now he is simply becoming a “threat” that opposing defenses have to be aware of and respect in their game planning. Adding Lee Evans back into the mix will only make the purple attack that much more explosive in the coming weeks and months. With potentially two viable deep threats on the outside, the underneath areas in which Anquan Boldin, young tight ends Dennis Pitta and Ed Dickson, and running back Ray Rice operate in will expand almost exponentially. Congratulations to Torrey Smith, and let’s hope his evolution from “threat” to “weapon” continues on the steep upward trajectory he set for himself against the Rams. I was originally going to single out the passing defense – not the offense – in this week’s W.I.N. However, upon further review, I’m actually more concerned about the Ravens’ inability to move the ball through the air, and especially the complete absence of wide receivers from their game plans. Sure, the passing defense was bad on Sunday – Matt Hasselbeck dropped back 42 times and was never sacked, and put up 358 yards through the air. Pass defense, though, is a lost art in the NFL in 2011. The league has done pretty much all that it can to encourage gobs and gobs of yards via aerial assault, stopping just short of tying defensive backs’ hands behind their backs. Look around the league – the top seven quarterbacks in terms of passing yards are AVERAGING over 300 yards per game. Tom Brady and rookie Cam Newton are putting up regular 400 and 500 yard performances. What is most concerning at the moment is not the Ravens’ inability to stop the pass, but the fact that they are so far behind the times in their offensive strategy, and their inability to hop aboard the pass-happy train that has stormed through the league. Joe Flacco has averaged 210.5 yards passing through two games, good for 25th in the NFL, and ahead of only such gunslingers as Andy Dalton, Kerry Collins, Tarvaris Jackson, Alex Smith, Donovan McNabb, Matt Cassel, and Luke McCown. Ravens wide receivers have caught a total of nine passes through two games – seven by Anquan Boldin and two by Lee Evans. To put that in perspective, Titans’ wide receiver Kenny Britt caught nine passes by himself on Sunday. Titans wideouts hauled in a total of 21 balls against the Ravens. There are 22 wide receivers in the NFL who have caught more passes through two games than every WR on the Ravens’ roster combined. Sure, the Ravens fancy themselves a run-first, smashmouth type of squad, but with NO threat coming from the wideouts whatsoever, teams will be quick to take that away. One of the problems on Sunday was protection. Flacco was sacked three times and harassed all afternoon, despite the fact that the Titans blitzed only three times all day. They consistently generated pressure with only four pass rushers (sometimes only three). Unfortunately, things may get worse before they get better. Evans, who has been dealing with a sore ankle since game 3 of the preseason, and is obviously playing at less than 100%, may get a few games off in the near future, according to Coach John Harbaugh. Without Evans, the Ravens will be pretty much forced to line up rookie Torrey Smith (0 catches, 1 target in 2011) on every down. Fellow rookie Tandon Doss has been inactive through the first two weeks, which needs to change. The focus in practice for B’More this week should be getting Smith and Doss integrated in the offense ASAP. There is no reason they can’t start contributing sooner rather than later. The Ravens have tossed around the excuse that Boldin is only in his second year in Baltimore, while Evans, Smith, and Doss are in their respective firsts, as to why there isn’t more chemistry between them and Flacco. To counter that argument, I would simply again point to the gaudy numbers put up by Hasselbeck on Sunday. Matt is in his first year with any of those Titan receivers, but they seemed to be a well-oiled machine here after just two weeks. To borrow a line from Ray Lewis, bottom line, it’s time to start getting the guys with jersey numbers in the 80s involved in the offense. That’s What’s Important Now. For the last couple years here at the Nest, we’ve had a weekly segment called “Play Like a Raven.” In it, I chose a player (or group of players) who most “played like a Raven” in that week’s game and gave them my e-game ball. I also picked a guy or a group to berate a bit for what I deemed sub-par performances. Well, for no reason other than I’m a little bit bored with it, “Play Like a Raven” is going on indefinite hiatus around these parts. 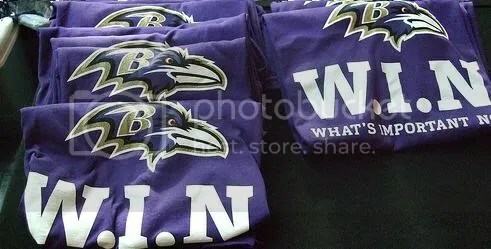 The Ravens have embraced “W.I.N.” ever since Harbaugh arrived in Baltimore three years ago. Let’s not save the best for last. Cheap Shot, come on down! Rashard Mendenhall, have you met Haloti Ngata? The Ravens thoroughly outhit the Steelers on Sunday, as evidenced above. They physically intimidated them and imposed their will, directly leading to the WIN. That’s What’s Important Now. You are currently browsing the archives for the W.I.N. category.